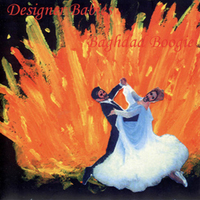 Gringo Records - DESIGNER BABIES - "Baghdad Boogie"
Designer Babies collage the old and new, fast and slow, melodic and abrasive. Their influences range from old blues and rock n roll to traditional Mauritian music and Japanese experimentalism. Nestled within the stylistic content of Designer Babies’ musical creations is the underlying recognition that it is no longer possible to create something truly new within a rock genre. Although effects lend variety, rock music has reached its physical limits in its instruments and techniques. The only option left in a society that thrives on nostalgia and recycling is therefore to fuse together styles and combinations of instrument and sounds in a way that celebrates the new yet pays homage to the past. This results in a music of contrasts, one which does not take itself too seriously to appreciate the humour and irony of what it is doing. The name reflects this providing recognition of the aural dangers of manipulation and splicing together different musical characteristics, in a grim parallel to genetic manipulation. Designer Babies quickly gained a reputation across the thriving underground scene of Nottingham as a band at the cutting edge of creativity, having played with the likes of Oxbow, Melt Banana, The Apes and Wolves! (of Greece). Dusty’s intricate guitar riffs belt out from an Ampeg amp, fuelled by intense drumming and electronics. Kushal’s lyrics float over melodic passages, then sink below the depths of crazy noise, wailing from within the music, while stalking the stage forcing the audience to take notice. Designer Babies represents the danger of synthesis and manipulation in today’s capitalist culture. The band provides an antithesis to our contemporary world of manufactured and reincarnated music, a Frankenstein to the sickly sweet digitally modified music of pop princesses and gigolo boy bands.